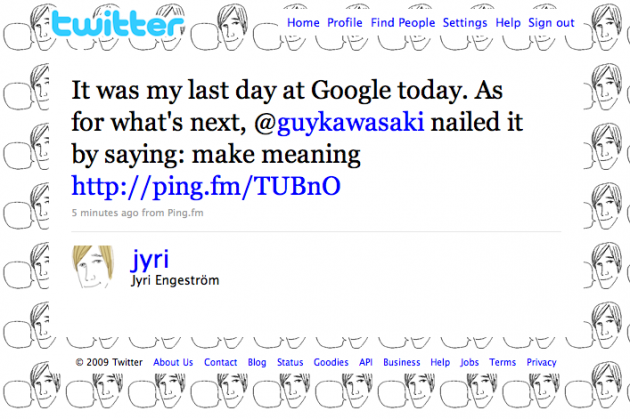 In October 2007, Google bought the Finnish social networking site Jaiku. In the following couple of years, they somehow managed to do absolutely nothing with it, even as rival Twitter rose in popularity. Today, co-founder Jyri Engeström is leaving Google. When we last talked to him in May, Engeström seemed to be enjoying what he was working on at Google. And as he told us in January, “We’re not dying, we’re morphing,” after Google decided to cease internal development of Jaiku. Rather than killing off Jaiku completely, like it did with Dodgeball and others, Google decided to allow Jaiku to be ported over to App Engine, and open-sourced. Sadly, still not much has come of that. And now, it’s unclear how much Engeström will have to do with the project from this point on. The reason is that he’s moving on to other things. As he notes in his tweet, he’s aiming to do something that “makes meaning,” borrowing from something Guy Kawasaki says in one of his books. We know a little bit about what that will be. First and foremost, we hear Engeström had a strong desire to move back to his native Finland. 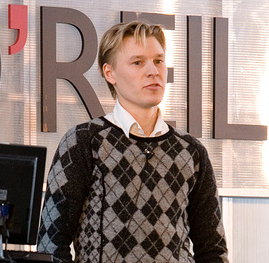 Following the Google acquisition of Jaiku, Engeström and his family moved to San Francisco to work at the Googleplex. While here, he did manage to make connections that seem to point us in the direction of what he’ll be doing next. One of those connections is Chris Messina, an important figure in the open web development community. Word is that Engeström and Messina are working on something around the term “social objects,” which Engeström coined. This will likely have something to do with Activitystrea.ms, another project Messina is working on, we hear. Both of those things seems like they may be more of projects though, than startups. So you can probably look for Engeström to try his hand at another one of those soon as well. It seems likely that upon his return to Finland, Engeström may also do some angel investing of his own. Most recently, Engeström gave an interesting presentation with some thoughts on social elements. I’ve embedded it below. As for Google, their legacy of acquiring startups in a hot space, only to run them into the ground and lose their founders, continues. At least they got a solid two years out of Engeström.